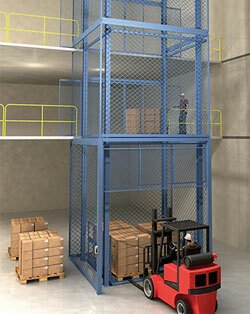 Mezzanine lifts are an ideal vertical transport method. What type should you specify? Facility space is expensive—very expensive—so it’s become increasingly important to utilize it to its full potential in any industrial facility. 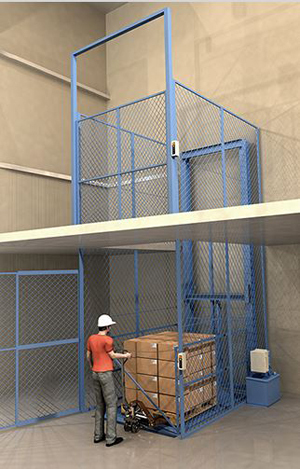 We’ve seen many companies find ways to expand their crowded operation utilizing mezzanines and other elevated work platforms that help seize the vertical cube. There are multiple methods for moving materials between vertical levels, and vertical reciprocating conveyors (VRCs) are one of the best. With an array of carriage types, drives, designs and power sources available, what vertical lift might meet your needs? This design installs a platform between vertical beams and propels it along the entire height of those beams. 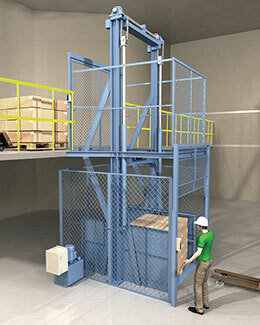 This is an efficient and smooth way to drive a vertical lifting device. It’s a great design for high capacity applications and larger platform sizes. A straddle VRC deals with high rollover forces (when you are loading or unloading the platform); the loading method must be detailed when the lift is specified. The straddle design suffers a little because it’s limited to loading or unloading operations from the two ends opposite each other. A cantilever VRC extends its loading platform in front of its masts. This is an excellent design if you want loading/unloading versatility. You can work on three sides (front, left and right) of the platform. Also, since the platform isn’t contained inside the mast structure, load heights aren’t restricted by overhead structures, as in the case of straddle type lifts. This also means that the unit’s overall height isn’t as restricted as some other types. Cantilever-type vertical conveyors also occupy less of an overall footprint than other types of lifts, meaning the VRC commands less space to transport a given load. Obviously these advantages are on a per-application basis. Care must be taken in the overall design for a cantilever system, as loading and unloading it creates “overturning momentum”. This force is transferred to the surrounding building or structural bracing. This force must be taken into account when a cantilever system is designed. The cantilever design may also be a bit limiting when it comes to platform sizes and capacities. This is because of the way loads may be positioned in relation to guide structure. This system places the platform between four guide masts that drive the loads vertically from their guide posts and the floor. These systems typically have bracing to handle lateral loads. It’s a very strong design for the heaviest load weights and extensive platform heights. You can access the platform from all four sides for loading and unloading operations. Conversely, this system also has the largest footprint of any VRC type. It delivers lots of capacity and load versatility, but also demands the most floor space. Hydraulic lifts are the most common types because they are less expensive to manufacture. They suit a broad variety of applications. These systems typically utilize a single hydraulic cylinder and multiply its effectiveness using cable or chain systems. Hydraulic systems might also incorporate a cylinder to drive the platform to move the load. Gravity and holding valves are utilized to lower a hydraulic lift in a controlled descent. Hydraulic systems are efficient and economical, but offer less travel distance compared to mechanical lifts. They are almost always used for two-level systems, simply due to their limited travel range. Unless the VRC is equipped with a positive stop or level locking system, accurate stops are not easy in either the unloaded or loaded state. Mechanical VRC’s are used for very heavy loads, high cycle times, longer vertical travel distances or multi-level applications where intermediate stops are necessary. They are utilized frequently in fully automated lifting applications, applications where higher lifting speeds are needed, or very high-cycle applications. Mechanical systems offer precision stopping accuracy, whether loaded or unloaded. They are more expensive than hydraulic lifts but deliver exceptional value for the right application. In other words, if your application demands a long vertical travel, if it is very heavy-duty, and if you’re constantly using the system in a high-cycle operation, it is likely you will end up with a mechanical system. If you’re considering a vertical lift project, it’s best to consider your load size, its weight, how quickly and how often you will need to move it, and by what method. The array of questions is broad, but we can assist you with any questions or concerns.